In this equestrian sport it is not only a matter of an excellent player, but also of a physically and mentally suitable horse partner, who mainly contributes to an outstanding performance. Many polo players choose the Polo Argentino, a breed from the Argentinian Criollo and the English thoroughbred. These polohorses combine the toughness and endurance of a Criollo with the speed and agility of a thoroughbred. Thus this horse breed has the perfect characteristics for polo playing. 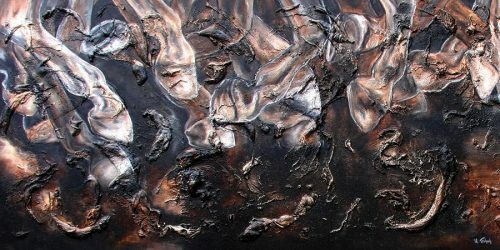 Kerstin Tschech’s artistic representations are set in the middle of a scene from a polo game in which the rider and his horse have to assert theirselves against another player and his horse. In this composition, the artist pays particular attention to the dynamics and liveliness of the horse and its rider, while the angle of vision is directed at the ball. As an observer you get the feeling to be directly at the place of the event. In polo, two teams of 4 riders each, aim to use their long wooden clubs to get the ball into the opponent’s goal. There are numerous tournament rules for the protection of the horse and the rider. 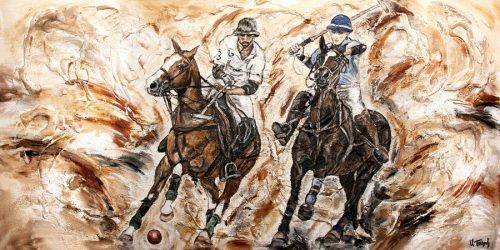 The sport of polo began in Iran, Afghanistan and Northern Pakistan before becoming popular in Great Britain and Argentina in the 19th century. Especially in this South American country you will meet the best polo players in the world. Nowadays you can choose between Beach Polo, Arena Polo and Snow Polo with your polohorse. The polo shirts of fashion designer Ralph Lauren are also popular not only at equestrian tournaments.